Ever consider going electric? 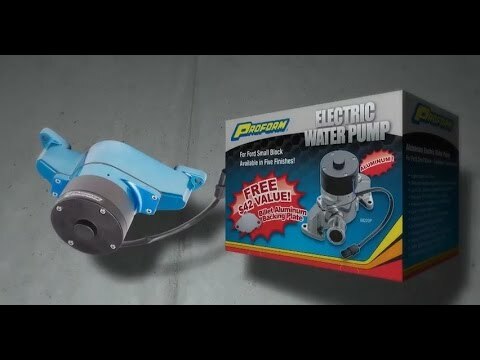 PROFORM's affordable electric water pumps eliminate unnecessary weight and impeller drag experienced at high RPM, pumps up to 35+ gallons of water per minute, and delivers the cooling that can make the difference between a win and second place! Durable but light-weight die-cast aluminum, epoxy powder coated for corrosion resistance in the color of your choice. Race or street. Comes with mating weather-tight connector. Draws 6 amps. Billet fitting (1in pipe to 1 3/hose) included. Affordable electric water pumps eliminate unnecessary weight and impeller drag experienced at high RPM.